So, to experiment with the versatility of sprouted whole wheat flour I made peanut butter cookies. (by using whole ingredients like these I convince myself the cookies are in some way good for me). Anyway, the cookies are great, but every great cookie deserves whipped cream, in my opinion. Luckily I usually skim much of the cream off our raw milk, which gives me the opportunity to use it to make butter, or in soups or other recipes. Much of the times it goes to the worthy cause of being whipped. And, so it was. 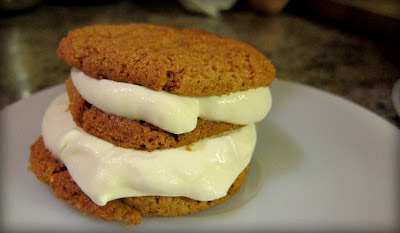 Peanut butter cookies and Honey whipped cream. I mean, is this a stroke of genius or what? My mouth says ‘yes’, enthusiastically. *note, whole wheat sprouted flour is available at whole foods market milled by Arrowhead Mills. Granted, it is much cheaper starting with the grains, but for those folks who want to start with a less daunting undertaking. **second note, baking cookies with whole wheat flour doesn’t have to end in cookies that aren’t delicious. The major key I’ve found to make certain they are delightful and soft is to under bake them, maybe even a lot, then to store them in an airtight container while they are still a little warm. ***and yes, there’s a third, whipped cream with honey is the epitomiacal representation of the goodness of the milk & honey combo…then there’s the peanut butter & honey. divine.